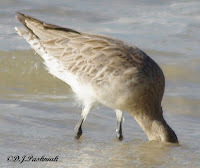 Bar-tailed Godwits are the most numerous of all the migratory shorebirds around the bay. Because of this I often ignore them while looking for some of the rarer migrants. However, at this time of the year the change into breeding plumage makes them especially interesting to watch and photograph. A few days ago this flock was in the little bay just south of Norman Point. There were also a number of Pied Oystercatchers roosting with them. I could see only faint hints of breeding plumage on any of the birds. However, most were feeding instead of resting during the high tide. They need to stock up on food and store a lot of extra fat for energy before they begin their northward migration. 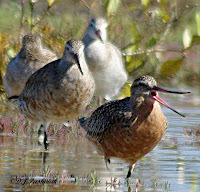 I found this group of Godwits a couple of days later roosting in the South Crab Creek area. There was a huge variety in plumage ranging from those that were still in total non-breeding plumage to those already showing lots of red and darker colors and patterns down their back and wings. Eventually the red will completely cover the front of the males. A roosting flock of Godwits is quite noisy. They remind me of a yard full of chooks - (chickens to those in the northern hemisphere!) - constantly chattering to each other. This one looked to be making a much louder statement. great post again, MIck. nice info and great photographs - the last one, the open-mouthed one is my favorite :) Good lookin' birds! 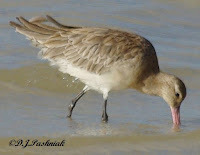 Great shots of the Godwits, It nice to see the ones with the red on its chest. Thanks for your comments Johnny and Eileen. I should have said in the post that these birds breed up in Alaska. Wow, that is a big group of Bar-tails! Our local celebrity (the stray Bar-tail) seems to have left already. Thanks for commenting Bob and Lana. Isn't it strange that we all go for the "stray" bird - not that it is special elsewhere but it is special to us because we haven't seen it. Good to see them stocking up on food, Mick for that herooic journey we have discussed before. I have never seen one like that - just grey. But I am a southerner. Excellent captures Mick. I really like the third shot of the Godwit with the morsel in its beak and the last one with the red breast and open beak. Hi Denis they all seem to change plumage at slightly different times - some are very early and some much later. Watching the changes at this time of year certainly makes good birding. Thanks Larry - so many time you just see them resting with the head tucked under the wing - not very exciting at all! louder statement - yes I can hear that. In a few years time I will take a long trip to Australien and hope to see some of the birds you show. Great shots! Thier migration is quite amazing!